A look at one space-elevator design. Space-elevator tech, a longtime sci-fi staple, is about to get a test here in the real world. The Japanese STARS-Me (Space Tethered Autonomous Robotic Satellite-Mini Elevator) payload arrived at the International Space Station (ISS) on Sept. 27, aboard Japan's robotic HTV-7 cargo spacecraft. The experiment was produced by researchers at Shizuoka University in Japan, in collaboration with Obayashi, a Japanese construction firm. "The upcoming experiment reminds us that testing in space is critical to progress in major projects," said Pete Swan, president of the International Space Elevator Consortium (ISEC). 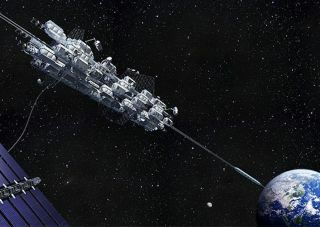 The tether satellite and climber demonstration by Japanese researchers "will fulfill a necessary engineering test along the way to space-elevator operations, even this early in the mega project called the Space Elevator," Swan told Space.com. "They, indeed, will be able to claim the first tether climber in space," he added. "This could be the story of the century: Reliable, safe and efficient access to space as a transportation capability that is nearer than you think." Artist's illustration of the Japanese STARS-Me (Space Tethered Autonomous Robotic Satellite-Mini Elevator) experiment. While STARS-Me is an important experiment, the establishment of an Earth-to-space elevator remains a "miles to go" task. Still, Swan is upbeat. "The space-elevator community feels that we are 'tech ready.' We would pass the classic technology readiness assessment that is standard to the development process," Swan said. Recently, the ISEC recognized that the overall space-elevator project must be discussed within a larger framework. The new vision of space elevators centers on the realization that the basic infrastructure is the starting point in the discussions. But setting up that infrastructure could lead to very big things, advocates say — a "Galactic Harbor" that will enable a great deal of commercial activity in the final frontier. "What we see is large commerce and industrial regions in space, supported by this new revolutionary space access transportation system — an elevator," Swan said. Space elevator operations from Earth could make possible a "Galactic Harbor" of business enterprises, advocates say. Two critical problems stand in the way of a space elevator, but each is solvable. That's the view of space elevator expert Jerome Pearson, the president of STAR of Mount Pleasant, South Carolina. The first (and tougher) problem is making the tether material strong enough to support its own weight hanging from geostationary altitude. "Progress has been made, and after decades of work, there is the prospect of single crystals 62,000 miles [100,000 kilometers] long with the required strength. The best materials are based on carbon structures, either nanotubes or graphene sheets," Pearson told Space.com. "The collision problem is being complicated by plans from OneWeb, SpaceX and others to provide internet connectivity over the world by launching thousands of new satellites into low Earth orbit," Pearson said. "The space elevator will need to avoid all these satellites, or the satellites themselves will need active avoidance and enough station-keeping propellant to avoid the space elevator. Either approach is difficult." Michael Laine, president of the LiftPort Group, wants to shoot for the moon. The plan is to create a permanent tether system on the moon that is reusable, replaceable and expandable. One end of the tether would be at the surface of the moon, secured at Sinus Medii, the elevator's landing site at the lunar equator. The other end would be in the balance point of cislunar space, at the L1 Lagrange point. Putting the system in place would allow for the transport of material along the length of the tether to and from the surface of the moon and the environment of cislunar space, Laine said. By using a solar-powered "elevator car" to deliver cargo to the surface of the moon, entire spacecraft systems (such as landing gear, descent engines and propellant) would no longer be necessary to conduct mission operations. A diagram showing an operational "Lunar Space Elevator Infrastructure." LiftPort's proposed Lunar Space Elevator Infrastructure has been under study for nearly two decades, evolving from the original project of an Earth Elevator, sans the heavy restrictions of gravity. "The materials exist" to build this huge tether, Laine told Space.com, although he said LiftPort is still working to find the "Goldilocks" one that is just right. "We have 12 materials that are more than strong enough," he said, adding that the core of the lunar space elevator would be wrapped with other materials to create a composite tether. Laine said the idea of a lunar tether is gathering more momentum, given the increased attention the moon is now receiving, not only from NASA but also the European Space Agency's "Moon Village" concept. Space-elevator expert Jerome Pearson envisions great opportunites coming from the concept — but more work needs to be done. The extraction and exploitation of lunar resources could help spur activity on the moon's surface and the construction of a lunar tether. But those resources still need to be assessed, Laine said. "The data is starting to come in. We need some ground truth. I think water ice is probably the binding one that makes us all excited," he said. "But it's a bit of a crap shoot. There's need for an army of robots to dig into the lunar dirt and rock and see what's there." Lunar ice could be processed into oxygen and water, as well as rocket fuel. Lunar tether operations could create an off-moon primary fuel depot and shipyard for an advanced space mission, Laine explained. Though Laine and his group have ambitious goals, they've fashioned a step-by-step methodical plan to achieve them. "Ground testing of tether materials is first, to down-select what materials are best-suited for the Lunar Space Elevator initiative," he said. "Then, we see taking materials to the International Space Station to validate the tether can survive ultraviolet and radiation. The next step is to send those materials out to be exposed at a Lagrange point." Laine said that a lunar elevator would transform our interaction with the moon, Mars and the rest of space.